Life here is like stepping in a time portal as you live like a Maharaja in the opulent surroundings of the Taj Rambagh Palace. The palace butlers are always on hand: whether that be to organise a horse drawn carriage in the evening, pour you a delicious cocktail or polish your shoes – you can rest in comfort knowing that your every whim will be catered to. The food is exceptional also, so sit back and enjoy everything that this great hotel has to offer, we know you won’t regret it. 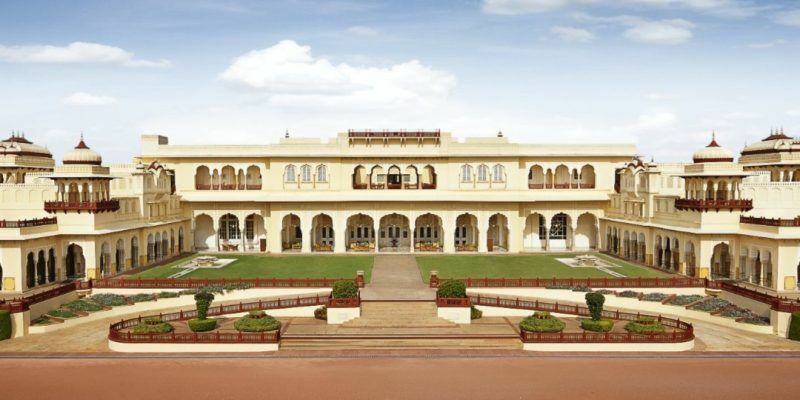 The Jaigarh Hall is perfect to host a lavish banquet, able to cater to 450 reception guests, whilst the Kesar Bagh gardens provide a beautiful backdrop for a ceremony of up to 1000. For something a little more intimate, the Mubarak Mahal features Rajput decor; a lovely setting for a small wedding breakfast of 20 people. Why not join us on the Mughal Terrace in the evening, where the royals used to play holi, the festival of colours. Or perhaps you have a grand wedding in mind and would like the vast lawns of the Naksha Garden, able to cater for up to 2200 people. With so many options available, couples would be hard pressed not to find a setting at the Taj Rambagh Palace that ticks all their boxes. "Our son got married in Jaipur, and we had the Mehendi ceremony, and the wedding reception at the Taj Rambagh Palace hotel. Prior to the reception the hotel had organised a Royal Wedding Procession. The hotel did an outstanding job of coordinating all events. Chef Sameer Shah's cuisine was outstanding. The reception on the main lawns with the backdrop of the hotel has left an indelible impression on our minds. The staff delivered impeccable service."